Dragonfly has been closed for years (or at least it seems like it to me), but it is open again for business. Last night was their opening. The name of the restaurant/bar has changed to Current, but there’s few other details available. The interior is more open and modern. 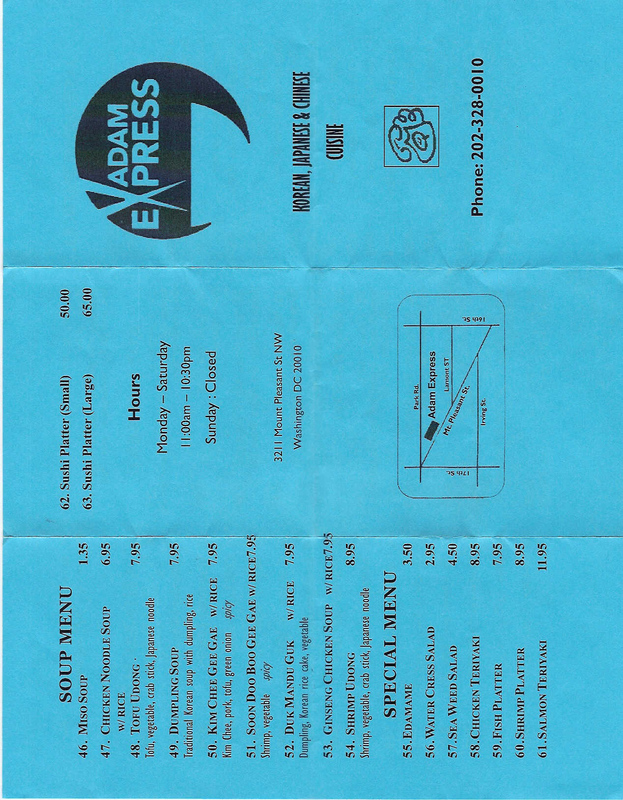 And since this is a food blog, here are some photos of their (limited) menu. Have you been? Is it fun? Do you like it better than Dragonfly? 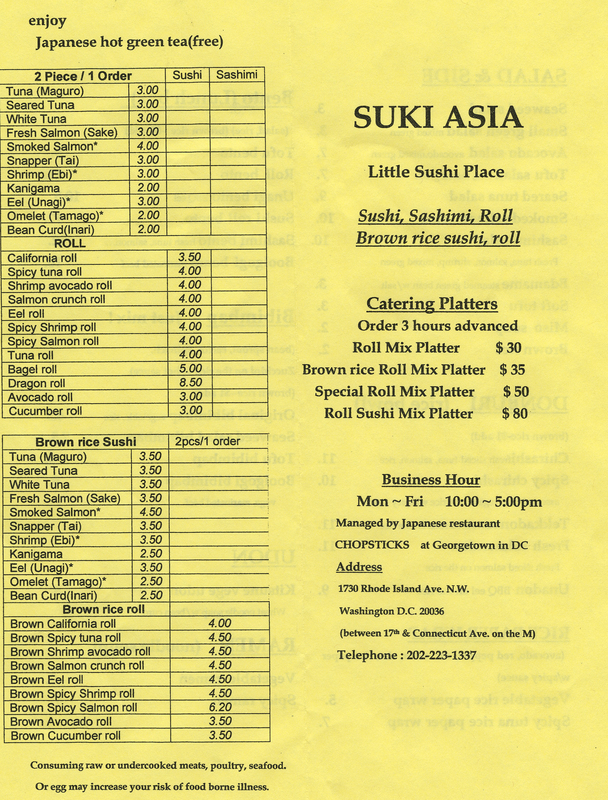 I vaguely remember when Suki Asia opened — I think two or three years ago. 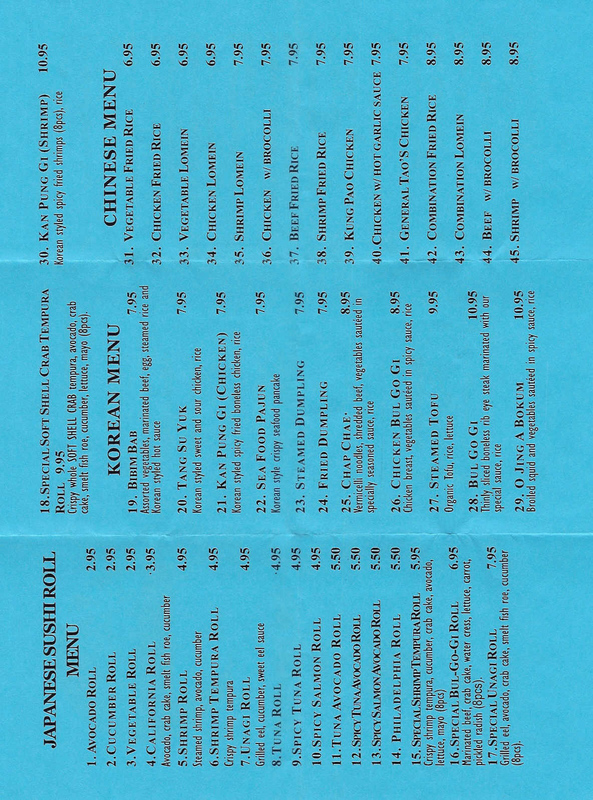 I have been once before and remember ordering sushi and it was pretty good. But it had been a couple of years since I had been so I thought I’d try it again for the blog. 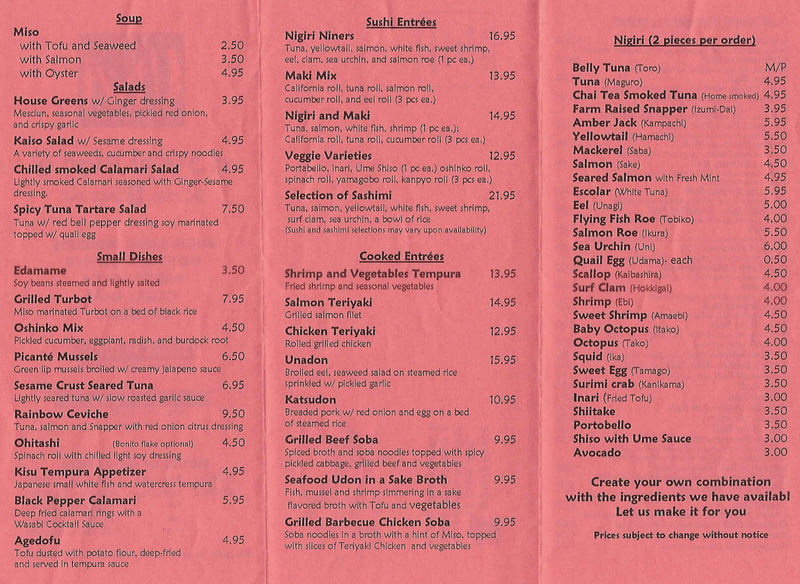 Their menu is pretty brief and actually fits on one page here. 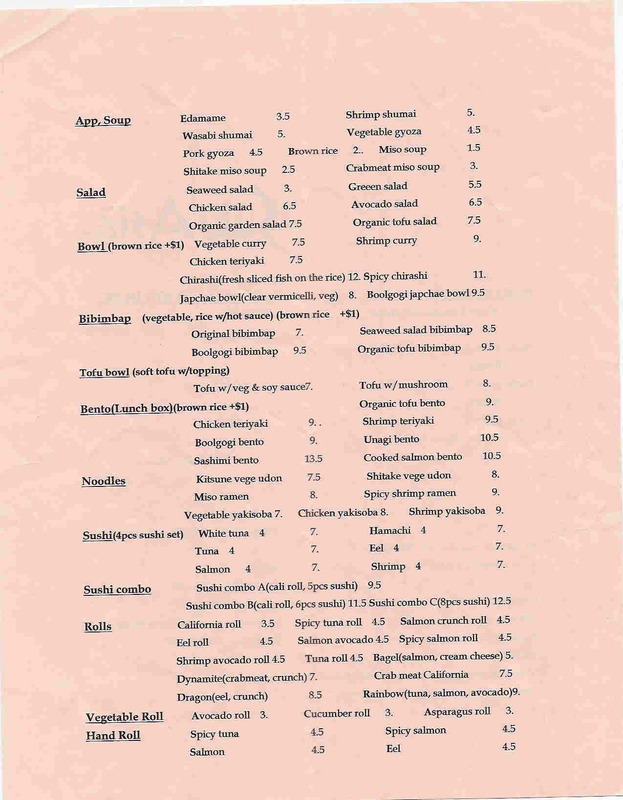 11/2008 – Here’s their updated menu. Page one here and page two here. Food: I was hungry and so I decided to order their original bibimbap and a bagel roll. First, the bagel roll. They get points for not dying their ginger to that horrible pink color and instead, leaving it to its original state. I also give them major points for not giving me so much wasabi that I feel like I’m wasting it. Their bagel roll was pretty good and I’d definitely order it again. Next to the bibimbap. I thought it was OK, but the bulgogi cart definitely makes a better version. Plus, there was no egg. And there wasn’t that much in there, but what was there was decent. UPDATE: My lunch buddy kept raving about their udon mushroom with tofu so I had to try it. It was really good (no MSG so no weird after-taste). There weren’t a lot of veggies though, but the noodles and broth were really good. A super filling lunch! Service: They’re very nice and while it can seem busy with a lot of people, they are pretty efficient. Atmosphere: While it’s not a very big location, it has 5-7 tables. The interior lacks much decoration, but considering most people are grabbing and going back to their office for lunch, it doesn’t really matter. Overall:I think I’ll skip their bibimbap and go to the Bulgogi cart instead since it tastes so much better and is cheaper. But I do like their sushi so I would definitely go back for that. 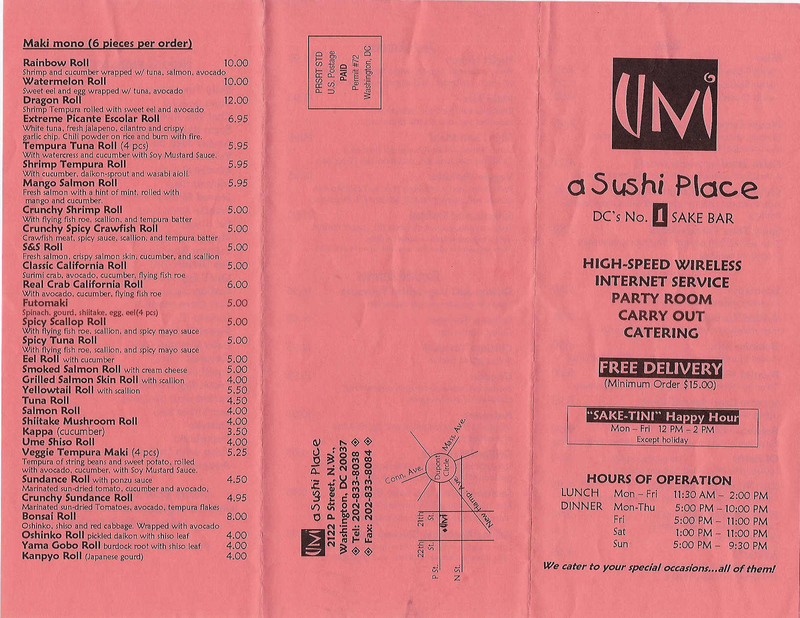 When I moved to DC, I loved that you could order sushi and it’d be delivered to your door. Where I used to live, Thai was about as exotic you got for delivery. I’ve eaten at Uni a few times before this review. Food:Working late one night, I ordered the Chilled Smoked Calamari Salad (left photo) and Mango Salmon Roll (left) and Extreme Picante Escolar Roll (right). The salad was tasty and I would definitely order it again. It was light and fresh — yum! The Mango Salmon was OK (it’s not peak mango season so it was flat and tasteless). The mint was also really bad. So bad in fact that I had to take the leaves out and I love mint! The Picante Escolar Roll was pretty good and I would order it again because it did have a nice kick. Update:So I ordered the Chilled Smoked Calamari Salad, Sundance Roll (with sun-dried tomato), and the Mango Salmon Roll. The chilled Smoked Calamari wasn’t smoky and not as delicious as I remember it. The Mango Salmon was better, but it’s not my favorite. And I absolutely hated the Sundance Roll. There’s way too much sun-dried tomato. Service: I’ve eaten here before and the service is a bit “hit and miss.” I’ve had really nice, pleasant waitstaff and then really unpleasant, rude ones. And when I ordered for delivery, they had a person who didn’t speak English very well (at all) answering the phone. Atmosphere: Inside it’s a pretty small restaurant, but if you’re looking for a sushi restaurant with a private room — this is about the only place in the city. Overall: I think it’s decent sushi at a reasonable price. While their service can leave something to be desired, they do deliver to my office ($15 minimum food order for free delivery). 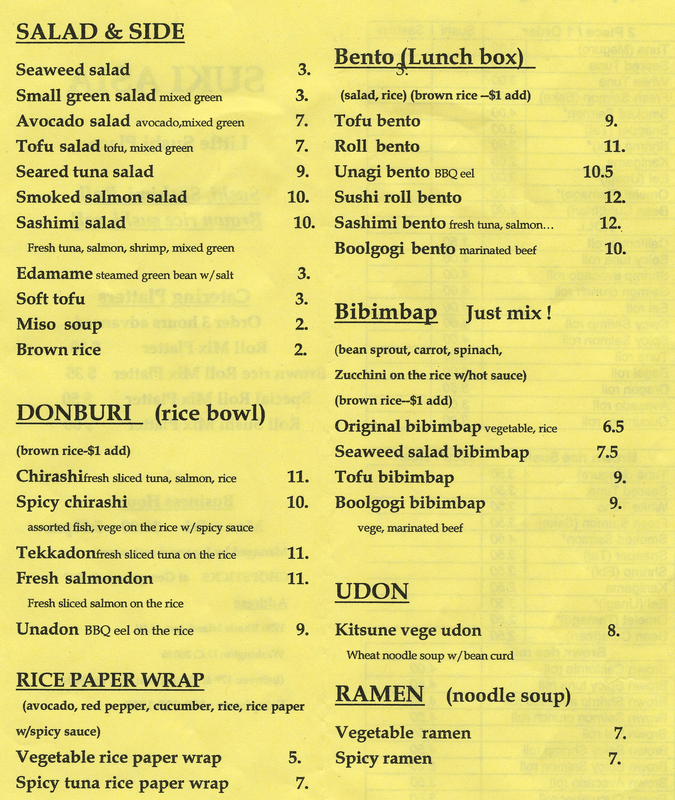 And if you’re looking for their menu, here you go: Uni Menu Page 1 and Uni Menu Page 2.